Debby Clarke Belichick was the wife to Bill Belichick; an American football coach who is currently the head coach of the New England Patriots, in the National Football League (NFL). She is amongst a few women who gained fame after their marriage to prominent celebrities as her marriage with Bill was a typical example of such. Things were going smoothly for the duo until 2004 when they called it quits despite being college sweethearts. As they say, nothing breaks a relationship more than unfaithfulness, Bill played a fast one on his wife and got a share of his coin. A lot thought their divorce would break Debby but she has proven otherwise as she has turned out to be a very successful businesswoman. Here is all you should know about her. Bio – Who is Debby Clarke Belichick, Bill Belichick’s Ex-Wife? Born as Debby Clarke but later adopted the name Debby Clarke Belichick after her union to her ex-husband, Bill Belichick. Quiet and reserved Debby was born sometime in 1955 in Nashville, Tennessee. She is of white heritage and also an American. Debby Clarke Belichick gained prominence as her ex-husband; Bill Belichick is a prominent figure in the football industry. Bill Belichick is the head coach of the New England Patriots in the NFL. He plays by his rules and is not a member of the NFL coaches association despite having served in the capacity for a quite a long time. Assumptions may make us believe that if Debby hadn’t married Bill she would have maintained her very private life as details about her parents, education, and childhood have been taken off the records. Nevertheless, we know that Debby Clarke Belichick is a boss of her own, she has done so well in business and is the co-founder of The Art of Tile & Stone store located in Wellesley. Debby Clarke Belichick walked down the aisle with her college sweetheart, Bill Belichick in 1977 but never knew that their union would only last for 28 years with three beautiful children. Of course, things went smoothly for them, you could say they had it all, a wonderful source of income, children, and happiness. But it never lasted as their marriage crisis started when Bill couldn’t take his eyes off Sharon Shenocca – the former New York Giants receptionist. His affair with Sharon started after she separated from her husband Vincent Shenocca. Afterward, Bill bought her a house worth over $2.2 million. Little did he know that the affair would cost his real family and also end his marriage. Prior to that, Bill was formerly linked to Linda Holliday of Jupiter Florida. He met her at a club and further started an affair with her. The relationship was no rumor as they were later seen severally during the week that led to the Super Bowl XLII. By 2004, Debby and Bill couldn’t stand themselves and finally decided to take a break whilst processing their divorce. Due to how things went, their divorce was not easily finalized as it took two years before it was made formal. 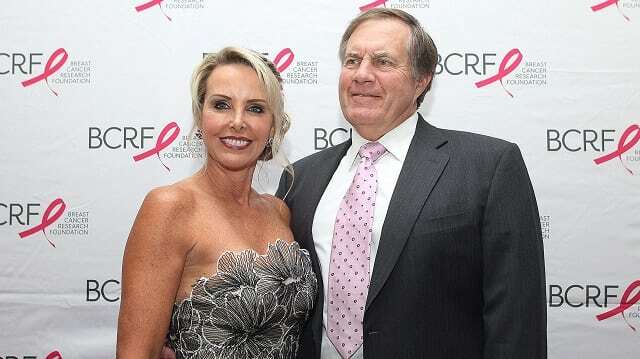 It is no secret that Debby Clarke Belichick has maintained a very low profile and is currently single while her ex-husband Bill Belichick has long moved on with Linda Holiday. Bill has heavily publicized his relationship with Linda, he uploads different pictures of them on his social media platforms. Debby and Bill may have been divorced and has also put their union past their lives but they wouldn’t deny their marital vows produced children that remind them daily of their togetherness. They were blessed with three Children- two boys and a girl namely Stephen, Brian, and Amanda. The children took the path of their father as a sportsperson and are also doing so well. Stephen, Brain, and Amanda took keen interest with the Lacrosse game and has also done so well with it. Bill and Debby’s first and only daughter, Amanda graduated from the Wesleyan University in 2007 and was an active player in lacrosse while at school. She was skilled at the game and was hired as a lacrosse coach for Connecticut preparatory school and she also worked in the school’s admission unit. Afterward, she served as interim head women’s coach at Wesleyan University and later became an assistant coach in the women’s lacrosse team for the University of Massachusetts Amherst. She also served as a lacrosse coach for Ohio State Buckeyes and was named the head coach for the women’s lacrosse team at Holy Cross College in 2005. Their first son, Stephen also did amazingly well in the game of lacrosse but is also skilled at the game of football. He gained scholarship with Rutgers University and graduated. Upon graduation, he was made the assistant coach with the New England Patriots sometime in May 2012. Subsequently, he became the team’s safety coach in 2016. Brian their last son engaged himself with the game of Lacrosse as well. He was an active player during his days at Trinity College. He later became the scouting assistant to the Patriots Front office in the college.